Cebu Pacific Promo Fare: Can't stop the SEAT! More and more seats on sale this June! Cheaper fares are available for destinations to Dumaguete or Tandag (Surigao Del Sur) as well as Boracay! 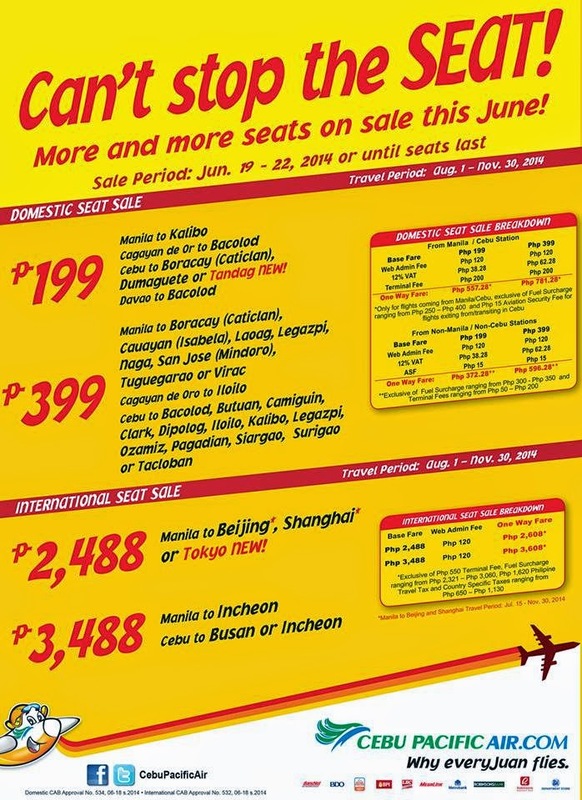 Cebu Pacific is also having a seat sale in some of their international flights to Tokyo, Beijing, Shanghai and Incheon. Check out below. Quoted DOMESTIC one way fares are inclusive of Base Fare, Php 120 Web Admin Fee, 12% VAT, Php 200 Terminal Fee for flights transiting in or exiting from Manila/Cebu Station and 7 kg hand-carry baggage allowance, but exclusive of Fuel Surcharge ranging from Php 350 – Php 550, Php 15 Aviation Security Fee for flights coming from Cebu and check–in baggage. Terminal Fees ranging fromPhp 50 – Php 200 for flights originating from non-Manila/non-Cebu Stations must be paid at the airport. Quoted INTERNATIONAL one way fares are inclusive of Base Fare, Php 120 Web Admin Fee, and 7 kg hand-carry baggage allowance but exclusive of Php 550 , Php 1,620 Philippines Travel Tax, Fuel Surcharge ranging from Php 1,035 – Php 2,928, Country Specific Taxes ranging from Php 430 – Php 1,190 and check-in baggage. Promo fares have limited availability and are non-refundable but rebookable subject to the following rebooking fees: Php 1,200 for Domestic destinations and Php 2,000 for Short-haul International destination plus fare difference. Please noted that booking fee rates range from Php 120 - Php 200 depending on purchase channel. For your convenience, flight changes, availing of prepaid baggage allowance for check-in baggage and web check-in service can be done up to 4-hours before scheduled flight. ask kulng po kung may promo on dec. 2014 ..manila to tacloban? sana kpag nagbook ng ticket online pwd ang savings kc lagi nlang credit card..
oo nga sana may piso fare pa..
may promo po ba kayo para sa august ang flight...manila to Davao. may promo po ba kayo ...ang flight sa october po..
75% Off Promo On All Domestic Destinations! Piso Fare Promo to Kuwait!